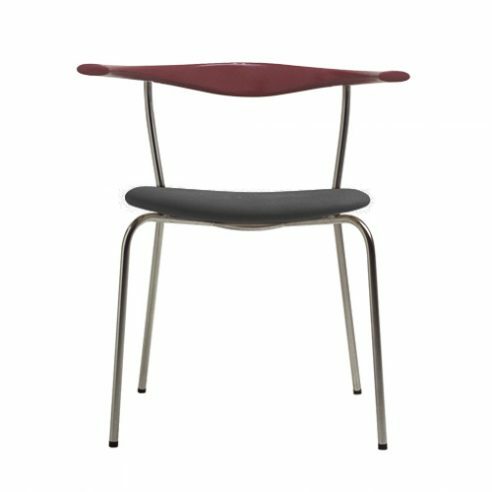 The Small Steel Minimal Chair (PP701) functions well as a dining room chair. It can be placed well under the dining table when not in use, thus saving floor space. Thanks to the shape of the backrest, one can sit all the way back in the seat and draw up close to the edge of the table. PP701 combines cold steel with warm, organic wood and leather in a harmonic fashion and thus can be considered related to the Swivel Chair (PP502). As to the shape of the backrest, here, too, there is a clear similarity with the so-called ‘livestock chairs’, that is, the Cow Horn Chair (PP505), the Bull Chair (PP518) and the Buffalo Chair from 1957. Today this chair can be had with a seat upholstered in leather or fabric, as well as countless surface-treated types of wood. In addition, the back comes in both a black and red lacquered version. called ‘an exceptionally elegant little chair’ at the Cabinetmaker Guild Exhibition, for which he received a 1,000-kroner exhibitor’s award. At the time he considered using it as a dining room chair in his new home, possibly in a wooden-leg version.